What is a cookie, you ask? Well an internet cookie is not chocolate chip based (I know, we were disappointed too) but instead they are a small piece of text that is transferred to the browser you are using by the website you are visiting. 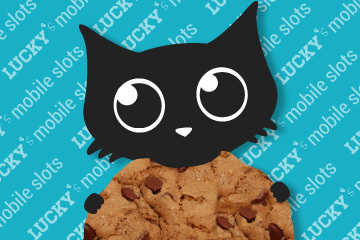 They are used to help the website – in this case LuckyMobileSlots.com to remember a little information about your visit. All information stored in the cookies is anonymous, meaning we don’t know who you are, we don’t know your eye or hair colour, or even your pets name. They are stored locally on your device’s (computer, phone or tablet etc..) browser and are removable at any time by yourself by changing the relative browser settings. Here at Lucky Mobile Slots we want to make your experience the best it can be. That means faster page loading speeds, so you can get to the mobile slots and casino reviews you want to read quicker and easier. Targeted content, so you see more of the promotions, news and slots that are applicable to you, based on the country you are viewing our site from. Which means that you will need to allow cookies in your browser for this to happen. We also want to be able to see how many people engage with our site, what pages have the most visits and what content might need to be improved via the use of Google Analytics. This not only benefits us but also you by being able to get the most relevant information you need. We sometimes might embed content from other sites including videos from YouTube, sharing tools from Twitter and Facebook or other websites. Social Media – Plugins or social media sharing icons from the likes of Facebook, Twitter, and Google+ serve cookies in order to share our pages across their social networks properly. YouTube – When you view a video that has been shared from YouTube and embedded on our site you will see some session cookies be added to your browser which help with the playback of the specific videos. These only last the time at which your are browsing the individual page which has a video on. Affiliate Cookies – When you click on any of our affiliate links a cookie will be set by the visiting site in your browser to determine the site which referred you to them. This is usually represented as a long string of numbers or a site name. This does not hold any personal information about yourself and does not impact your use of our site, or their site. It is merely there as a means for us to be recognised as the site that referred you if you decide to sign up or purchase any goods from their site. Another way to manage cookies is to see the relevant help or setting options in the browser you are using. Each browser is different, but you’ll be able to disable or enable cookies, and remove specific or all cookies currently in that browser. If you use multiple browsers you’ll have to change your settings in each browser. You may also wish to opt out of Google Analytics collecting your anonymous data which you can do so at any time by visiting: https://tools.google.com/dlpage/gaoptout/ and adding a browser add on to your browser.